FORS would like to extend a very warm welcome to the scheme’s latest FORS Champions and FORS Associates. 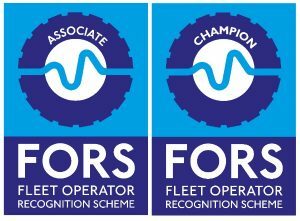 FORS Champions specify FORS in their supply chain or promote the scheme in other ways, while FORS Associates are those companies whose products and services directly align with the FORS philosophy of safety, efficiency and environmental protection, and who provide members with exclusive offers and discounts. If you are interested in specifying FORS in your supply chain or in providing exclusive incentives to members, please contact the FORS Helpline on 08448 09 09 44 or email: enquiries@fors-online.org.uk.